Strands of fresh pulled mozzarella are soaked in cream, mixed with earthy black truffles and then enveloped in a pocket of fresh mozzarella. Packed in a sea salt brine, our Truffled Burrata is loaded with flavor and will add just the right amount of decadence to any meal. Available in three sizes: 2oz, 4oz and 8oz. Stracciatella, also known as the “goodness inside Burrata” is made by soaking hand-pulled strands of mozzarella in cream overnight. A unique substitution for traditional Mozzarella, Stracciatella is the perfect addition to any summer cheese platter. Ricotta “Alta” (the top) is a basket drained ricotta made from top portion of our kettles. Creamy in taste and silky in texture, this cheese sets itself apart from our standard ricotta. The basket drained style is ideal for a party cheese plate. Spread on crackers or scoop from the basket with a spoon, this velvety cheese has trouble staying in the fridge. Hand dipped the old fashioned way from our kettles, Maplebrook Farm’s ricotta bursts with flavor. 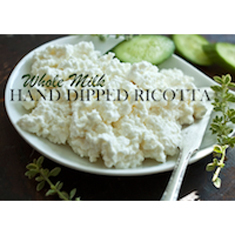 Our Ricotta is unique for its smooth delicate texture, full flavor, and outstanding quality. It is perfect for all recipes, whether savory or sweet. Try it on toast with cinnamon and sugar for a simple breakfast treat, or bake it into a lasagna for a traditional Italian family favorite. 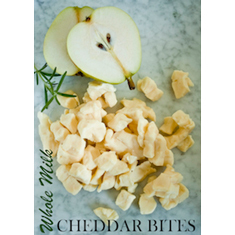 Is made in small batches using the highest quality cow’s milk from local Vermont farms. 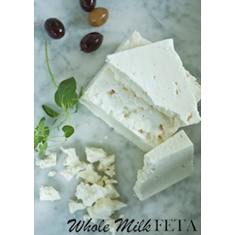 Finished with just the right amount of sea salt, the feta is creamy, smooth and has a silky texture. Small chunks of buttery cheese pulled from the vat before formed into blocks of cheese to be aged. Made in small batches, hand dipped and hand packed. This ricotta is smooth and has a delicate texture like no other you have ever tasted. 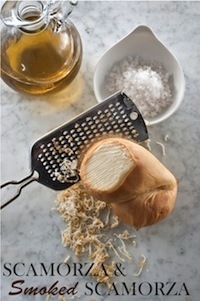 Scamorza is a dried Mozzarella that is made by producing a fresh mozzarella ball, which is tied about 1/3 of the way from the top, creating a pear-shaped cheese. It is hung to dry and mature for a few hours, and is then ready to enjoy or move on to be smoked over cherry wood. 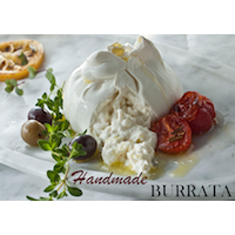 Authentic Puglian Burrata, made by hand, is a stuffed mozzarella that is filled with stracciatella (shredded fresh mozzarella that is soaked in a creamy base). 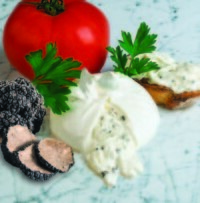 We also make our Stracciatella as a separate, stand-alone product.